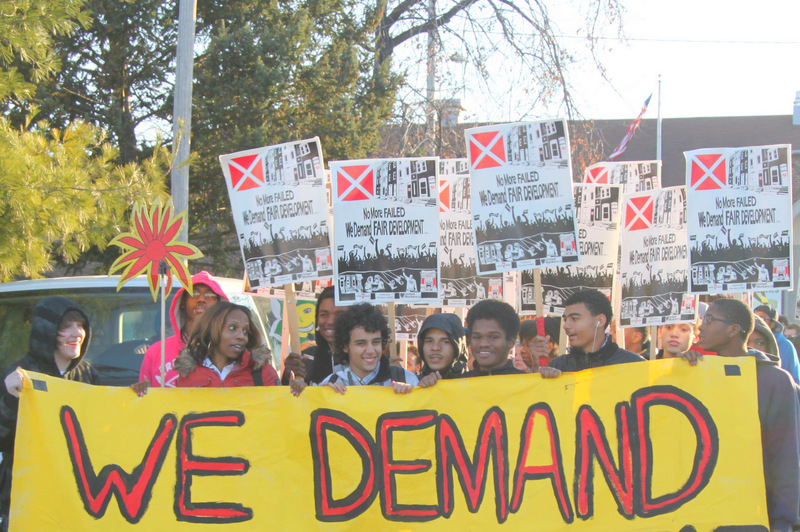 Students rallying against a trash incinerator planned in their South Baltimore neighborhood said researching and organizing was important. But talking to fellow residents made it plain to them how sick their neighborhood really was from pollution-linked disease. “One person said a neighbor three doors down had just died of asthma,” said Charles Graham, a senior at Benjamin Franklin High School who canvassed the streets of Curtis Bay and Brooklyn on weekends. 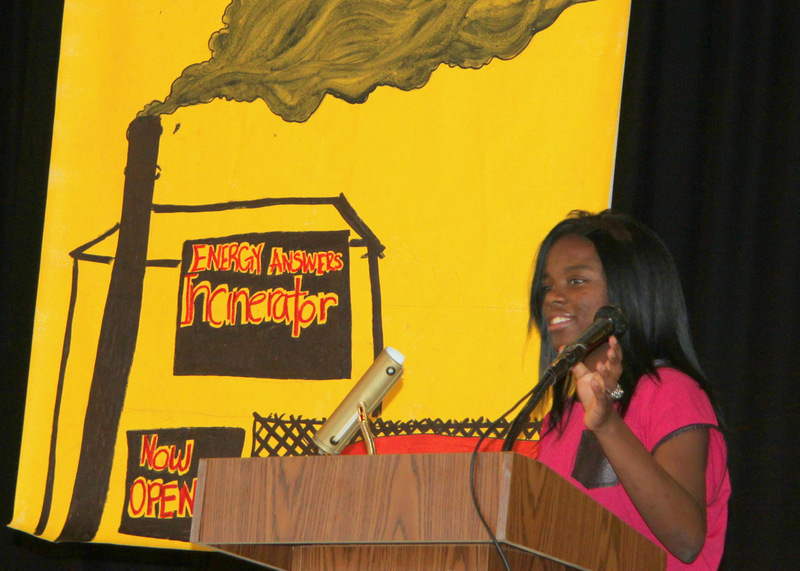 “We asked the students in one class how many had asthma and everyone’s hand went up!” said Destiny Watford, 18, a Towson University student who lives in the community, where rowhouses are just blocks away from heavy industry. 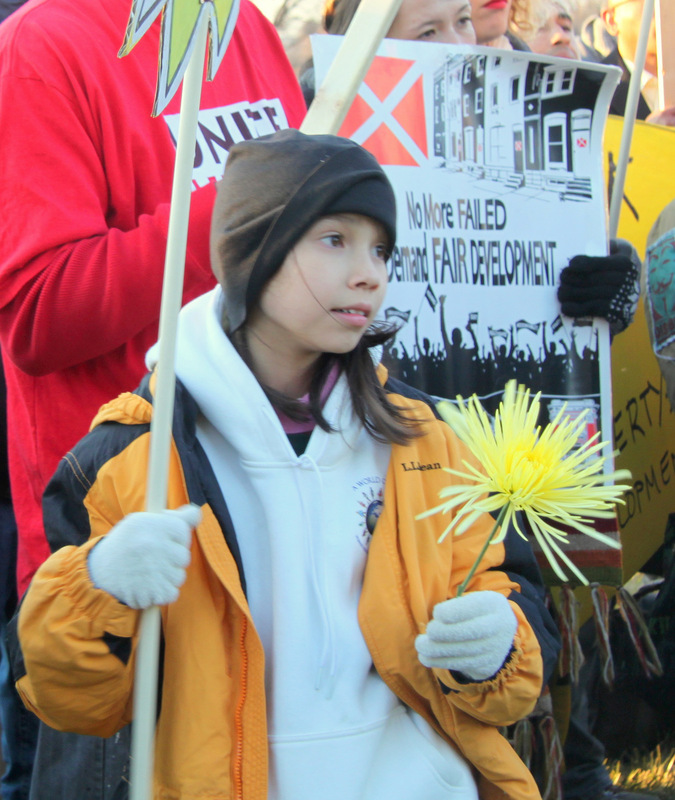 Their remarks came as the students prepared yesterday for a protest march with United Workers and Unite Here Local 7. Despite the depressing public health news and social justice insights (“This was completely disrespectful to the community – nobody knew about it, they hadn’t been told!”), Graham said he has enjoyed the experience. 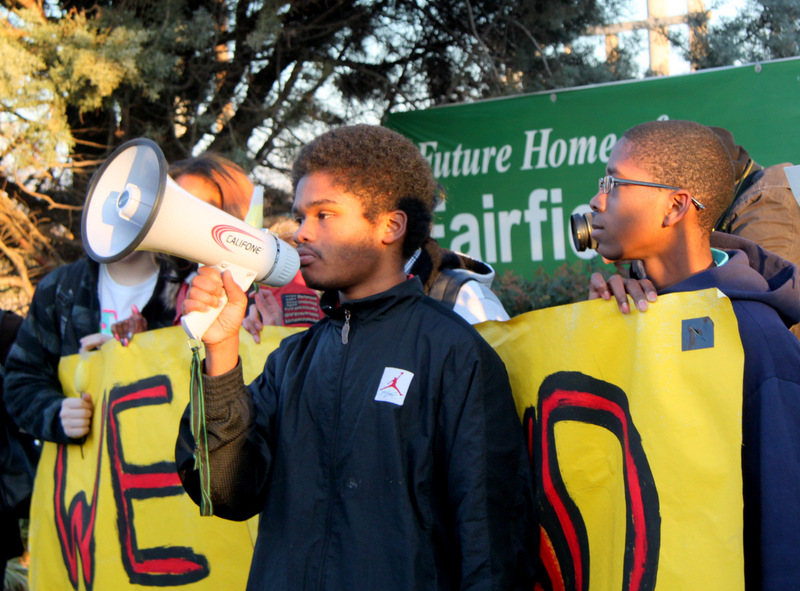 The students, who formed Free Your Voice (a 20-member human rights committee of United Workers), made the group’s website and Facebook page, wrote letters to public officials and collected photos, as well as signatures for a unique “photo petition.” (They have close to 2,000 signatures so far. You can see the photos on the website.) They met door-to-door with over 200 community members. Over time, Graham said, he came to believe that he and fellow students could have an impact. 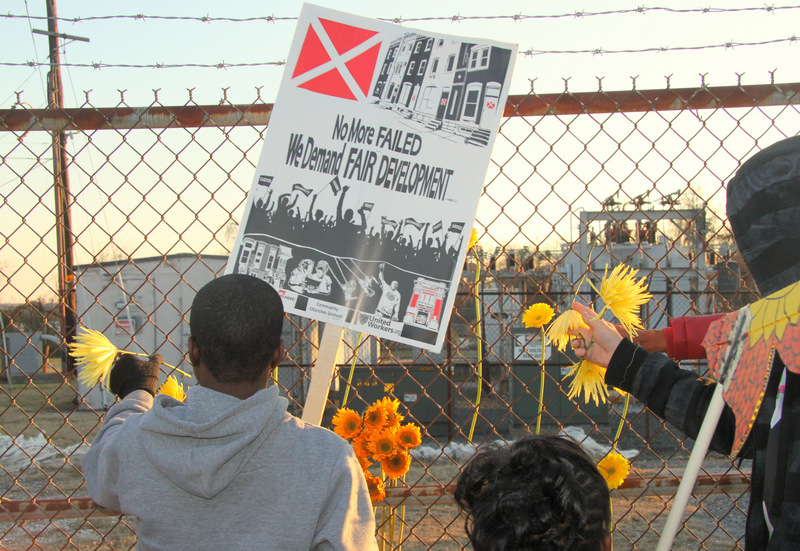 The protesters were going to walk to the site – a former chemical plant less than a mile from their school – where Energy Answers wants to build the 160-megawatt trash-to-energy Fairfield Renewable Energy Power Plant. Accompanying the students were a number of city civil rights and environmental activists, including David Flores, of Bluewater Baltimore, the new Baltimore Harbor Waterkeeper. He noted that the state of Maryland recently “petitioned EPA to take measures to control air pollution in states upwind of Maryland” and yet now supports “what is slated to be the largest trash-burning incinerator in the country.” He said the irony makes the incinerator project “an environmental justice issue” for this impoverished part of the city. At this point, the Martin O’Malley administration appears ready to let the project proceed. The Maryland Department of the Environment (MDE) has said the emissions of particulates, lead and other harmful substances would be within the legal limits. Environmental advocates say regulations have tightened since the plant was approved by the Maryland Public Service Commission in 2010. Local and national environmental groups say Energy Answers failed to meet an August 6 construction deadline, and that the lapse should have cost the company the “Certificate of Public Convenience and Necessity” it was issued by the PSC. In August, the company said they did do some work onsite and had met the deadline. MDE never replied to their letter requesting a detailed written determination as to whether the company complied, said Environmental Integrity Project attorney Leah Kelly, speaking with The Brew yesterday. MDE spokesman Jay Apperson offered this response to our query. 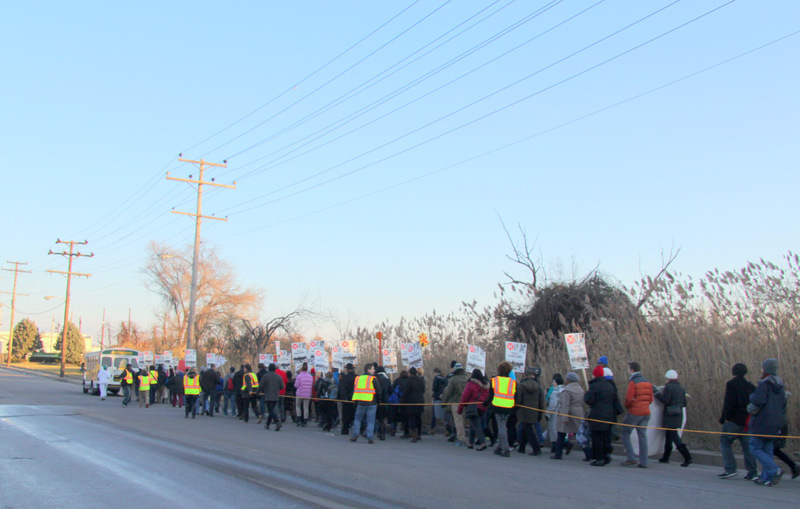 When it came time for the march on a frosty December day, the group spilled out onto East Patapsco Avenue, marching behind a school shuttle bus, protected from rumbling traffic by adults with reflective vests and monitored from above by what appears to have been a police helicopter. From the road, looking through the chain-link, barbed-wire-topped fence, there didn’t appear to be any construction or other activity at the site. Charles Graham, 18, said the level of pollution in his neighborhood struck him after he had been living out of state for a while and came back. “The whole place smelled like a moldy basement filled with plastic,” he said.